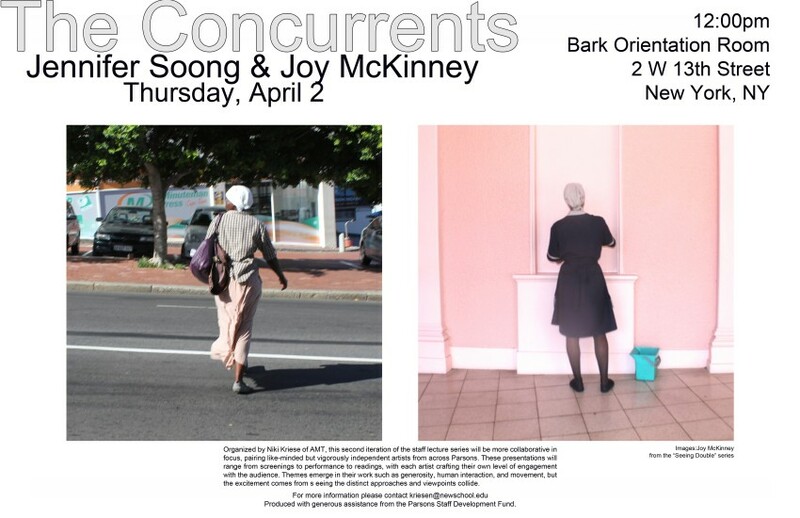 The first installment of The Concurrents lecture series, featuring Jennifer Soong from the School of Art and Design History and Theory, and Joy McKinney from the School of Constructed Environments, is happening on Thursday, April 2, at 12:00 pm, in the Bark Orientation Room (2 W 13th Street, 1st floor). Jennifer Soong is a poet originally from New Jersey. She began as a visual artist before going on to earn degrees in English and Visual and Environmental Studies at Harvard University. She has written extensively on Elizabeth Bishop and draws her influences primarily from the mid-generation American poets. She is interested in the relationship between text and image and is the recipient of numerous awards including the Joan Untermyer Poetry Prize. Joy Mckinney is a photographer based in NYC. She received her undergraduate degree from the Atlanta College of Art and her MFA in photography from Parsons The New School for Design. Her work explores social and cultural attitudes towards gender and race through photography and video. Organized by Niki Kriese of AMT, the second iteration of the staff lecture series is collaborative in focus, pairing like-minded but vigorously independent artists from across Parsons to co-present and discuss their investigations. Events will range from screenings to performance to readings, with each artist crafting their own level of engagement with the audience. Similar themes, such as generosity, human interaction, and movement emerge in their work, but the excitement comes from seeing the distinct approaches and viewpoints collide.